So what by Miles Davis serenades me while writing about the Republican primaries. It’s always fun to watch presidential candidates coddle their bases during primaries by extolling the magnitude of their orientation, only to reach the general election and water down everything they said merely months ago, their chests still smarting from self-righteous thumping. 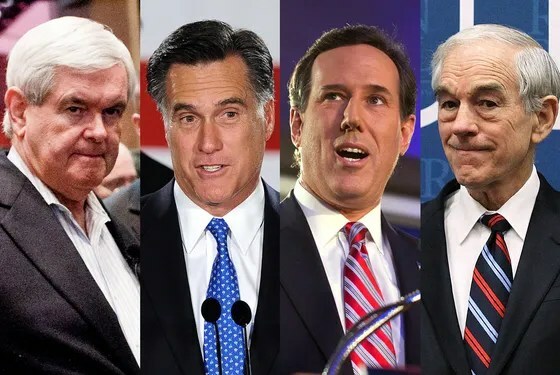 Mitt Romney needed to cruise through the primaries without any extreme right wing proclamations to take on Obama in November. He probably didn’t realize that the Republican base would sooner endorse a welfare-using pot-smoking mother-of-six than the ex-Governor, whose capacity for emotion would make a sociopath sit up and take notes. And they haven’t even played the Mormon card yet. Well, at least we can conclude that magic underwear can barely withstand the triumvirate of one wrinkled heartless crypt-keeper, one Christy senator whose main claim to fame is the guarantee of giggles upon googling his name and one shameless adulterer who was cheating on his wife while lampooning Bill Clinton for the same. The NIH budget is richer by a few thousands that can now go to fund illegal abortions. Some people need to be sat down and explained to that making abortion legal doesn’t make it mandatory. Only that confusion can explain the outrage on this issue. Also, wide availability of contraception doesn’t mean that the high school lunch lady will sprinkle crushed Plan B over your daughter’s apple pie. I think the employer-insurer nexus must go, but while it exists, insurance plans must cover contraception and abortion. An employer whose religious beliefs do not allow these interventions might be skittish about shopping for such a plan, but consider the alternative. Unwanted babies are less cared for and more prone to crime. Steven Levitt suggests that legalized abortion is responsible for half the drop in crime in the 90s. What if a Jehovah’s witness organization claims that forcing it to cover blood transfusions is religious persecution? Christian scientists do not believe in any medical intervention, and that disease is merely God’s will. Where does it end? Pharmacists who believe that contraception is against their religion shouldn’t be forced to sell them, and at least one judge agrees. People should not be forced to engage in any transaction. No questions asked. This isn’t a matter of religious freedom. It’s freedom. Don’t worry about the supply of contraceptives drying up. There are plenty of sane pharmacists. But I must ask these pharmacists how they reconcile their faith and their professions. The Bible does not weigh in on melanoma or the common cold. It’s not a big leap of faith that some scientific information led to their career choice. We live in a country where churches have automatic tax-exempt status. (Other religious organizations must file for this status if their gross annual receipts exceed $5000.) Everyone is forced by threat of state-funded violence, to subsidize Christianity in a country whose bill of rights begins with the words Congress shall make no law respecting an establishment of religion, or prohibiting the free exercise thereof…etc. Republican politicians love saying that the U.S. Constitution is founded upon Christian principles. If a 4,543 word document is based on ten sentences that would fit on an index card, wouldn’t the founders have mentioned that as a footnote? Maybe they were being paid by the word. What is exceptionally galling, is that a barely legitimate argument about gay marriage, immigration and abortion has descended to discussion of previously undoubted issues like contraception and mentioning Satan among adults (link to 2008 video). This election was supposed to be about the economy. But the economy, to the right-wingers’ chagrin, is doing better. Nobody is breaking out the champagne just yet, but we are far from the train-wreck predicted most gleefully by the right. Now that that angle is out of the window, the right has gone back to what it does best: kiss up to Christ and call Obama a pansy on the international stage. Whatever your politics, you won’t be taken seriously if you don’t admit that as far as national security is concerned, this president does better with a scalpel than the previous one did with a sword. He has ridden us of Osama and al-Awlaki with minimal cost. Mitt Romney cannot come out of this unscathed, and if he gets wounded enough, he won’t pose a real threat to Obama in November. The primaries have shown that Christ one-upmanship can reach ridiculous levels. The Christian death-grip on the right has sapped the traces of political discourse left in this country. Well written! I do agree that the employer-insurer tie-up has served as a convenient apparatus to pitch their ‘religious freedom’ trope. It is sad that the only highlight of the GOP primaries has been the countless caricatures it has spawned! It is difficult to predict whether it is a race to bottom for GOP. Mitt looks promising enough to compete well with Obama in November 2012, from the observations made on the Primaries. quite often, he shoots off his mouth which mostly all the candidates do in politics by default. Obama has still maintained his superior stand that he gained 4 years ago + the Nobel prize. I think there will be a close fight in the presidential elections Nov 2012. What a World of Ironies we live in… Romney talking about the health care mandate, Gingrich talking about religious freedom and the suppression of it (the church of ‘what a beautiful skirt, it will look better on my hotel room floor’), the Catholic church holding the moral high ground (less said the better), and the Republican Party calling foul and lamenting the destruction of piety for religious institutions (the same guys who love guns and blowing up things, and capital punishment).. Now, if only Palin’s daughter were to lecture us about per-marital boinking (I take it she was NOT on the pill) ! I guess you guys have already decided who should win. From what little I know, Mitt has a plan too and he did run for republican nomination earlier too. The issue is – Republicans are in majority in the congress and they do not want to let things go away just like that. I think it will be a tough fight. Also, the voters are disappointed with Obama, as little progress been done till now. Obama has made significant strides. Whatever your position on the morality of bailing companies out, the auto industry is doing better now. The big banks have returned their bailout money. Two famous and influential enemies of the state have been killed. More people are getting hired. As far as who should win is concerned, Romney didn’t win the primary in 2008. He is doing much better now, no doubt, but I don’t think he will be much different from Obama as president. He’s doing what he’s doing to get primary votes, but his policies as a president (should he become one) will be similar to his policies as governor of Massachusetts. My dear Padwan, I missed this in my earlier read “think the employer-insurer nexus must go, and this requires the government to repeal previous governmental action, but while this law exists, surely insurance plans must cover contraception and abortion.” I wanted to argue your “repealican” point. PPACA (the Health Care Law, or Obama-Care as said nasally by Michele Bachmann) mandates that employers over a certain number of full-time employees are required to pay for health insurance for their employees or pay a penalty. And in paying for their health insurance, some basic preventative care is on the list of required elements that the employer should support. I don’t see why that “nexus” has to be broken? Employers have been previously mandated to contribute to the Social Security fund of any employee. How is this different from that? Would you rather a WalMart employ thousands of people and not pay for their health insurance, and then they end up using Emergency room for basic health care? Oh BTW, the Emergency room was because of a mandate signed into law by Reagan called the EMTALA. I’d rather support a single-payer system than the current employer mandate. I think that makes more sense. This one makes no sense. I agree that people without health insurance end up using emergency services. I hate the concept of social security as well; it worked when the American population was growing fast. Now that there are a lot of retirees and not enough people to earn for them, I think people should be allowed to invest that money themselves. This is turning into a gerontocracy. First, Single-payer system is what I would have preferred too, as I would have World peace and a solution to the middle east crisis. This is what we could get. Second, 67% of Americans are in the age group of 15- 64 years, only 12% over age 65. And yet another 20% are in the age group of 0-14 years. Social Security is fully solvent, unless we keep dipping into it to finance unfunded wars or other exigencies. This gerontocracy, and that SS won’t exist is an attractive meme (with a theme) on anti-entitlement and anti-New Deal !). Invest it in the market, really? Here is a google graph. Note the rate of increase in population in the age-groups requiring social security in the future. The youth population increase is probably not going to compete with that. Hence, I think social security will implode. Granted this analysis is extremely primitive, but life expectancy is increasing as we speak. Here is a link to the social security government website. It states “After 2022, trust fund assets will be redeemed in amounts that exceed interest earnings until trust fund reserves are exhausted in 2036, one year earlier than was projected last year. Thereafter, tax income would be sufficient to pay only about three-quarters of scheduled benefits through 2085…” Of course, what’s probably implied is, “Don’t worry, we’ll keep printing money until there’s no cotton left to wear.” When the government says that it won’t be able to take care of the people tomorrow who are being forced to buy into the system today, might it be time to call it a pyramid scheme? The market is doing better now. I think people should have the option to take at least their share of payroll taxes. Let the employer-matched amount still get pooled. It’s not ideal, but it would be a good experiment.